$399 TWIN/DUAL BEAM HIDS: The following kits are HID conversion kits that work on any bulb that is a twin, or dual beam bulb (meaning both Low and High beams come from the same bulb). Like 9003(H4), 9004, 9008(H13). These kits are very similar to the picture and use a wiring harness to the battery and run the servo motor on the arc bulb (because there is a second beam to focus in both Hi & Low beams). Simple plug-n-play installation. Great to upgrade a ATV, Motorcycle, UTV, Ranger, RZR, or vehicle. These are NEW Brite Lites true Xenon HID conversion kits. Totally converts halogen headlights to a arc module with digital balast for the ultimate in headlight technology. All Brite Lites HID units are 6,000 degree arc bulbs- for a pure white light color with a tint of blue- most common in a Lexus or BMW. No modifications needed to stock wiring or headlight housing- totally plug-n-play. Simple installation- less than 30 minutes for most vehicles. Rated life is 10,000 hours and draws less amperage than stock bulbs (about 3.2 amps & 35 watts). 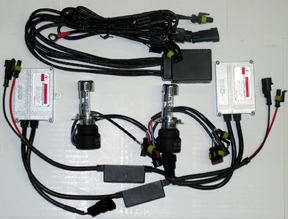 Kit includes a pair of HID arc bulbs, a pair of slim digital balasts, all needed wiring and connectors, zip ties, and mounting instructions/tips. Simple installation. About 4 times brighter than stock bulbs and no filiments to break. NOTE: Picture is of a H4 2 beam bulb with added wire and servo motor controller on arc bulb. This is on all 2 beam (Hi & Low) units. Single beam units do not have this and are lower cost. This item is a replacement part for any of the Brite Lites HID Rally or Work lamps with an internal HID ballast. It is a plug n play replacement for a failing bulb/electrode. *SPECIAL PROMO PRICE** These are NEW Brite Lites true Xenon HID conversion kits. Totally converts halogen headlights to a arc module with digital balast for the ultimate in headlight technology. All Brite Lites HID units are 6,000 degree arc bulbs- for a pure white light color with a tint of blue- most common in a Lexus or BMW. No modifications needed to stock wiring or headlight housing- totally plug-n-play. Simple installation- less than 30 minutes for most vehicles. Rated life is 10,000 hours and draws less amperage than stock bulbs (about 3.2 amps & 35 watts). Kit includes a pair of HID arc bulbs, a pair of slim digital balasts, all needed wiring and connectors, zip ties, and mounting instructions/tips. Simple installation. About 4 times brighter than stock bulbs and no filiments to break. NOTE: Picture is of a H4 2 beam bulb with added wire and servo motor controller on arc bulb. This is on all 2 beam (Hi & Low) units. Single beam units do not have this and are lower cost.